The Seated Liberty Dollar was minted between 1840 and 1873 in the United States.The current melt value for this coin is $11.53 although a coin of this period almost always sells for much much more. From 1840 until the passage of the Coinage Act of 1873, Seated Liberty Dollars were the coins produced from the U.S. Mint. During this time, most silver coinage produced by the Mint were essentially “on demand” and were only struck when the Mint was presented with silver. Initial design began in 1836 but the final approval wasn’t received until mid-1840 when a trial strike of 12,400 Seated Liberty Dollars were produced in July as examples of what bullion depositors would receive as struck coinage. 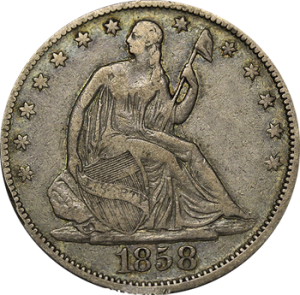 The Seated Liberty Dollar was minted between 1840 and 1873 in the United States.The current melt value for this coin is $11.53 although a coin of this period almost always goes for much much more. Until the New Orleans Mint began striking Seated Liberty Dollars in 1846, all silver dollars were produced at the Philadelphia Mint. The San Francisco Mint also struck hundreds of thousands of Seated Liberty Dollars, many of which were thought to be shipped to China to pay for trade goods. 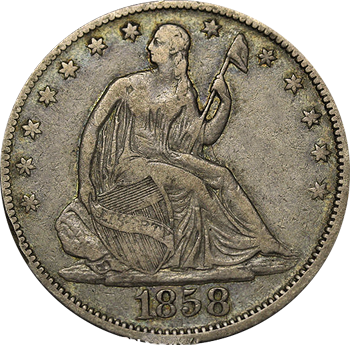 From 1870 until the abolition of silver dollar coinage in 1873, the Carson City Mint also struck the Seated Liberty Dollar as well. The entire striking, including all mints, from 1840 until 1873 totaled just under 3.2 million Seated Liberty Dollars. The lowest production years were 1851 and 1852 when only 2,400 total Seated Liberty Dollars were produced. Some years (1851-O and 1858) are also extremely rare due to no production with only proof strikes being produced. Also, many Seated Liberty Dollars were melted down by private owners and large melts were done in the New York Sub-Treasury to be restruck as smaller denominations. Although the initial design coins were struck in accordance of the 1792 law stating silver coin purity was to be set at .892 (89.2%), the Coinage Act of 1837 restructured silver purity to be .900 (90%) silver. Subsequent designs and the production coins all met the 1837 standards for silver purity. The Seated Liberty Dollar weighs 26.73 grams and has a diameter of 38.1 millimeters. The remaining metal content is copper and the edge of the Seated Liberty Dollar is reeded. In 1866, the reverse design was changed to add a ribbon with the text “In God We Trust” which became the standard used until the coin was abolished in 1873.